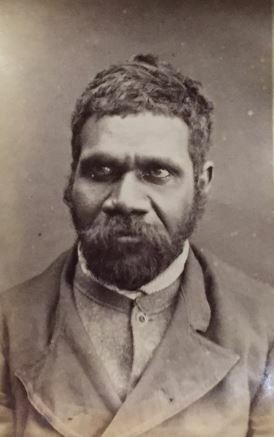 Billy Bogan, also known as William Field, was born on the Bogan River to the north of Nyngan in 1862, possibly at Billybingbone, another name he was known by. Employed as a tracker at Warren in 1882, he witnessed Charles Robertson stealing forage from the police station. Robertson was released on bail and he soon attempted to bribe Bogan with £10. When Bogan refused the bribe, Robertson plied him with poisoned whiskey. Bundah did not take the drink and testing in Sydney showed that it was laced with 10 grains of strychnine. Robertson was convicted of attempted murder and sentenced to 15 years’ “hard labour on the roads” Australian Town and Country Journal 11 November 1882: 17..
Bogan struggled at times to make a living as was common for Aboriginal men in the late 19th century. As a youth he was arrested on suspicion of having stolen a horse from Grenfell in 1875 New South Wales Police Gazette 20/10/1875: 303.. In 1884 he was before the courts again on another stealing charge The case was heard at Dubbo (New South Wales Police Gazette 12/11/1884: 444). And in November 1895 he was convicted at Cowra of household robbery. While being transported by train to Bathurst Gaol, Bogan and a German prisoner named Katz overpowered the guard and leapt from the train. Bogan travelled west and robbed a farm-house on the Bogan River before turning north and walking to Queensland. He was captured by Queensland police and trackers a year later near Charleville. He told police that he never feared the NSW trackers while on the run, although he correctly anticipated that Queensland trackers would pose a problem, probably because he was not related to them and owed no kinship obligations. Convicted of escaping from lawful custody, Bogan was incarcerated in Parramatta Gaol. He contracted typhoid and died of heart failure on 19 November 1900. He was buried the following day in Rookwood Cemetery. 1. ↑ Australian Town and Country Journal 11 November 1882: 17. 2. ↑ New South Wales Police Gazette 20/10/1875: 303.